﻿ Home - Garden Low Flow Irrigation System. 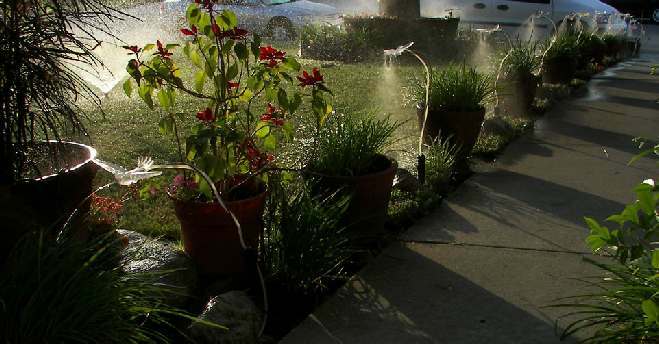 It is important for everyone to recognize the value of Water Conservation for Garden Irrigation and Landscape Irrigation. By using standard ¼” Drip Irrigation components Sprink-L-ites™ is the ultimate Low Flow Irrigation System. Water conserving Micro Irrigation Spray Heads regulate the water flow limiting the water delivery from 10 to 15 Gallons per hour. Compared to a ½” spray nozzle that uses between 24 gallons and 99gallons per hour, up to 6 times the amount of water used by the ¼” Micro Spray system. Water placement can be one of the most effective water conservation steps you can take. The Sprink-L-ites™ 21” bendable support increases watering efficency by allowing the gardener to position the water micro spray head to most effectively and efficiently deliver water directly to the desired area of the garden reducing wasted water. If water placement is not critical the bendable support allows the crystal clear acrylic sculpture to be positioned for the most aesthetic complimentary arrangement for night time illumination. Everything you need for a beautiful water conserving ornamental garden Irrigation System is included. The 6 station micro sprayer irrigation system comes pre assembled into a “T” distribution network to equalize water pressure. The included self threading micro spray nozzles are attached to 1/4” clear tubing threaded through the sculptured lights. Compatible with any 1/4” components. The sculptures can be aimed in any direction for the most efficient water application saving even more water. Simple installation - Layout the line, slip the clear tubing onto the nearest available barb, thread the clear tube and install the nozzles, connect to a hose or spigot using the provided adapter and turn on the water. You get 6 durable crystal clear acrylic sculptures that sparkle in the sunlight and create a mesmerizing color changing Landscape Lighting display at night. Patented Reflector design makes the shapes visible from over 150’ away. Not points of light but illuminated butterflies, Dragonflies and Hummingbirds creating colorful accents for any garden landscape. Slots for zip ties allows the lights to be attached to trees, branches, bushes, post, poles, or umbrellas for unlimited variety in placement. Unlimited landscape lighting applications with water conservation.